Summer and Winter Sampler Napkins, originally uploaded by davidscf. This cloth is fresh out of the dryer and ready to be cut apart and hemmed. I’ve spent a heap of time lately knee-deep in books in an attempt to understand profile drafts, blocks and unit weaves. This project was my first attempt at designing and weaving from a profile draft using Summer and Winter unit weaves. All four towels were woven using the same threading. The white and lilac (dyed by me) warp and tabby weft are 10/2 mercerized cotton. 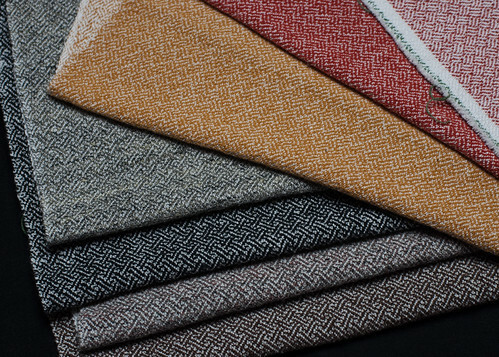 The pattern weft is 5/2 mercerized cotton. Warping Again, originally uploaded by davidscf. Warping again. This will be my third warp on my new Louet David 90. The first time I used Madelyn van der Hoogt’s front-to-back method from “Warping Your Loom” (with great success). Since the David is designed to be warped back-to-front, I tried out Jane Stafford’s method from the Louet Looms DVD with my second warp (also with great success). This time I’m picking and choosing the bits I liked best from each and slowly developing a hybrid method that works well for me. I liked Madelyn’s method for beaming and tensioning the warp and tying on to the breast beam, so I’m combining those with Jane’s method for spreading the warp with Louet’s awesome built-in raddle. The only part of Jane’s method that caused me some discomfort in my dodgy neck and back was sleying the reed. I’ve borrowed a Swedish technique for hanging the reed in front of the harnesses using a Texsolv heddle (outlined in “The Big Book of Weaving”). This is working much better and I think I now have a warping method that is not only easy, but puts absolutely no stress on my body. Yay! 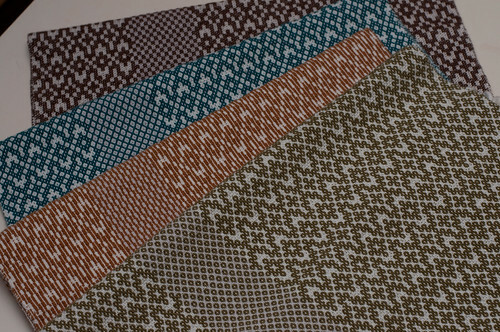 This project (yet another set of napkins) will be my first attempt at designing and weaving from a profile draft using Summer and Winter unit weaves. I’ve never woven Summer and Winter before, so there will be a lot of firsts with this project. Next Project, originally uploaded by davidscf. 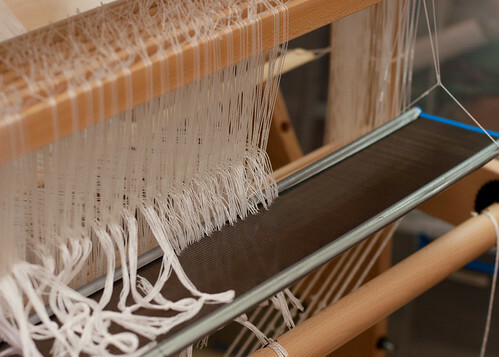 One of my goals at the moment is to try my hand at designing my own cloth and get some of the ideas I have out of my head and onto the loom. I’ve spent all of my free time for the last week knee-deep in books in an attempt to understand profile drafts, blocks and unit weaves. This project will be my first attempt at designing and weaving from a profile draft using Summer and Winter unit weaves. I’ve never woven Summer and Winter before, so there will be a lot of firsts with this project. 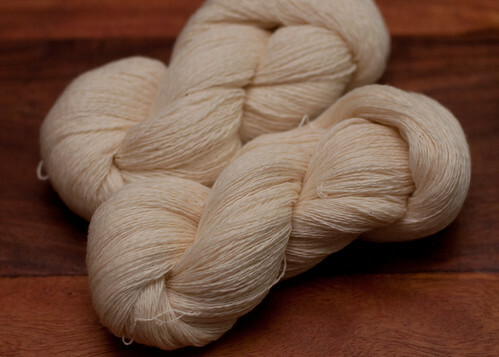 Although work has been keeping me busy, I did manage to dye some yarn for this project yesterday. I decided I needed a pale colour to offset the green and chose a light, silvery lilac. 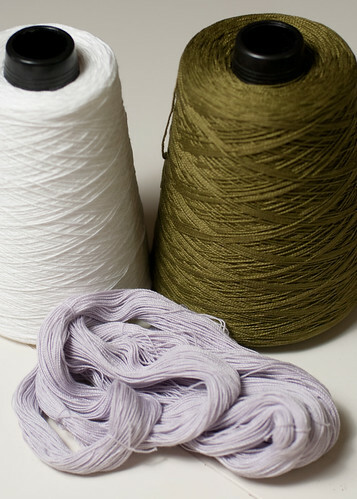 The white and lilac are 10/2 mercerized cotton (to be used for the warp). The white will also be the tabby weft and the green (5/2) will be used for the pattern weft. Cotton #2, originally uploaded by davidscf. Finished the second half of the cotton from my Tour de Fleece challenge. The second skein came out considerably finer than the first, so I’ll end up with a balanced weave for two napkins and an unbalanced weave for the second. These will now be boiled to finish them and hopefully I’ll get to start weaving tomorrow. Spun on my Bosworth Attache charkha using Acala sliver from Cotton Clouds. Towels, originally uploaded by davidscf. Fresh out of the dryer. They still need to be cut apart, pressed and hemmed. Drafts #355 (gold & rust) and #356 (neutrals) from Strickler’s 8-shaft pattern book. You are currently browsing the Southern Cross Fibre blog archives for August, 2012.